Hi all, after countless hours of researching the net I think I came up with my answer. But before I commit to it, I thought I better just check with the experts here. I am in the planning phase of my XS500B cafe build. I would like to go with spoke wheels and disc brakes. The reason is because that is the look I like, and I thought this would cut some weight. I realize this would require a rear arm change or welding a mount and adding a master cylinder for the rear brake. I am not against doing any of this. However, I am not finding any good options. My goal for this build is to create a good looking and running bike. At this time it will not be a race bike, but I will probably look into running it on a track eventually. I am trying to build this within reasonable costs as well. So is there a rear swing arm / wheel setup that I should be looking for that will work? Are there used wheels that are lighter than what I have with the rear drum? Sadly, since this is not a true race build, I am leaning toward option 1. I hope you can advise of something else. I don't know that I really want to get into buying new hubs, spokes, rims, lacing and truing. But I don't really know where this build will go, that is why I am planning now so I can figure out where I need to spend the money. as I´ve seen on the facebook group there is one red XS running with spoke wheels and disc brakes, maybe the user might tell U what parts he used. If it's a Euro XS500C then it may be one of the few early ones that came with wired wheels instead of cast from the factory- very rare! The 371 front wired wheel is a straight swap into any XS500- the part numbers are the same as for the XS500C with this option. But for the very unusual combination of wired rear wheel AND disk brake the hub was a special. Part No. 1J3-W2531-00 but I have never seen one available. I have however seen the complete rear wheels for sale on Japanese Yahoo auctions- remember they got the GX500 in some numbers. There's a fella on the Do the Ton forum building an RD (similar chassis) with spoked wheels and discs. He's using the rear hub and disc from a YZ dirtbike. Both rims are the high-shoulder XS alloys. An EX250 swingarm has the same pivot bolt diameter as the TX/XS but needs to be shaved down 3mm on either side, and the internal sleeve needs to be narrowed to match. Then you have to use the TX seals. The axle plates then need to be opened up to match the Yamaha axle. This gives you the option of either welding on twin shock mounts or running a monoshock, and has the disc brake torque arm mount on it already. It's also wider at the rear, so needs a longer axle. I suppose using the EX bit with new wheel bearings to fit the Yamaha wheel would work well, too. I've worked up an alternate swingarm /wheel combo that's easier than the EX250 swap and allows for more compatibility with Yamaha parts. The SRX600 twin shock swing arm is a bolt-in swap. No narrowing is required and the shock mounts are the same distance from the pivot shaft too. It's a bit wider at the rear and stock mufflers need to be moved out about 5/8" on each side but other than that it's a bolt-on swap. It's also about 1-1/2" longer but the adjustment slot is longer so running the axle all the way forward will be about like running the axle all the way back on a stock 500 arm. 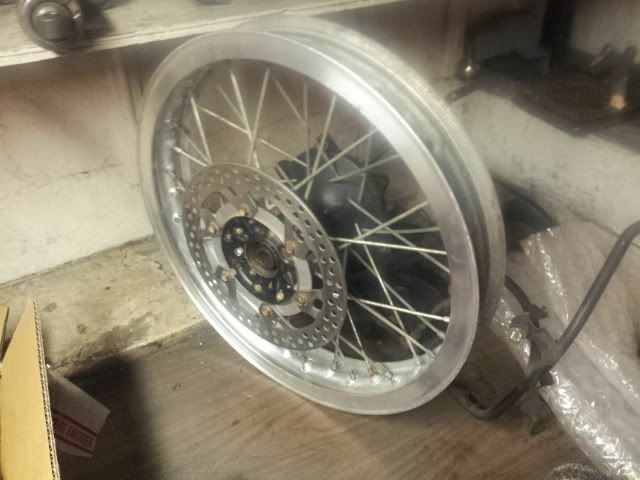 I've got a 1979 SR500 rear wheel for it that uses a disc brake. Same cast wheel spoke pattern as the XS500C but uses a sprocket carrier that allows 520 width sprockets! For monoshock arms the RZ350 and SRX250 use the same pivot spacer as the SRX600 and could have shock mounts welded to them. That opens up the possibility of using aftermarket alloy RZ arms too. The SRX600 is rarer but best because it uses a 20mm rear axle just like the XS500. The RZ and SRX250 arms are slotted for a 17mm axle but can be enlarged to 20mm. All three arms run the pivot shaft in needle bearings too. The SRX600 and RZ350 arms use rear disc brakes and that means the stock XS500C and later brakes can be used as is or the lighter 1980's era brake parts bolt on as well as rear wheels from a whole host of bikes. The SRX250 arm uses a rear drum and some dirt bike hubs like XT350 will bolt up right up to it. XT500/600 rear hubs should be no problem to fit up. Later XT600 hubs also use disc brakes and would make a nice combo. I haven't mounted the SRX/SR500 setup yet because I came on a '79 XS400 wheel that was lighter than the stock XS500 wheel and required no different hardware or spacing to install. Plus I got Sprocket Specialists to make up an XS500 pattern sprocket in 520 for me which met my goal of getting rid of the oversized 50 chain on the 500. When I pull the engine down on my bike I'll test fit it all and see if I really want to change or not. Okay, now I'm a little confused... The axle I pulled out of my TX measures .874"..... And I had all stock parts on my bike. My axle actually required my to open up the axle plates from the original diameter of 20mm... How could the original be 17mm? Sorry, I posted the wrong diameters. All TX/XS500s with spoked wheels and drum rear brake used a 20mm rear axle and 17mm front axle as original equipment. All of the XS500s with cast wheels and disc rear brake used a 17mm rear axle and 17mm front axle. Corrected to show difference between spoked and cast wheel axle sizes. Sorry, I posted the wrong diameters. All TX/XS500s used a 20mm rear axle and 17mm front axle as original equipment. ...but .874" is around 22.2mm so I'm still confused! I think that's the axle in his EX250 arm. Still an odd size for a metric bike. Fyi, this is what a YZ hub laced to a high-shoulder Yamaha rim looks like. The guy that built this wheel just sold me a hub just like it. The complete wheel weighs less than an XS650 hub by itself. And you can get sprockets as small as 41t, so no issues with gearing . Gee,that hub looks familiar! I lost 16 lbs off the rear. Does the year of the YZ hub matter and are the axle diameters the same? I'm currently considering a cast to spoke conversion and I would like to keep discs. Thanks. My YZ rolling gear just happens to be a 1989 model.Thats what I had. There are a million options you can make work.Pick something you like and something you can get at a fair price. I always though the cheap and plentiful Kaw EX250 Ninja 17" stuff would be a good option also. Do your research and start measuring.Sounds like a fun undertaking! Good luck!